Researchers in Southampton now have the benefit of a dedicated, brand new facility to develop and support pioneering research into patient safety and essential care. The Clinical Academic Facility, hosted by the University of Southampton’s Faculty of Health Sciences at Southampton General Hospital, will also develop a new generation of clinical researchers in nursing and allied health professions. The facility boasts modern laboratories and facilities for research that will benefit patients at their bedside, including areas such as preventing pressure ulcers, nutritional support, infection control and end of life care. 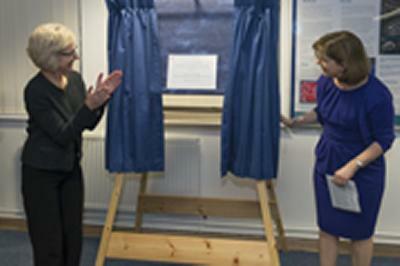 Jane Cummings, Chief Nursing Officer for England, officially opened the new facility on Monday 28th January 2013. Jane visited wards at Southampton General Hospital and talked to staff and patients. The development follows a number of successful initiatives across the University Hospital Southampton NHS Foundation Trust, including a new monitoring system for falls and bed sores, which led to a 25 per cent reduction in the number of serious pressure ulcers and 30 per cent drop in harm caused by avoidable falls within eight months. The two institutions also jointly conducted the UK’s first clinical assessment of the benefits of volunteer mealtime assistants for older patients to measure the level of impact ahead of a possible nationwide rollout of the scheme. In addition, a project to increase the use of bladder scanning for patients with urinary retention, led by Jacqui Prieto, a senior clinical academic research fellow at the University of Southampton and practising nurse, and the infection prevention team at UHS, removed the need for catheters, which account for 79 per cent of urinary tract infections, in 53 per cent of cases. Professor Jessica Corner, Dean of Health Sciences, comments: “This dedicated space will act as a ‘hub’ for our doctoral and postdoctoral clinical academic programme and is designed to develop first class clinical researchers to focus on essential care that matters most to patients and the NHS.